In attempting to amend this text slightly yesterday, updating it and adding the picture of me with John and Yoko below, I somehow contrived to lose it completely or at least make it invisible from the front page here. The only way I seem to be able to reinstall it is to recreate it as a category of its own along with all the others, as opposed to a little item by itself above the rest of them which is where it used to be. In order for it to appear at the head of the list, above Abba, I have spelt About with two A’s! 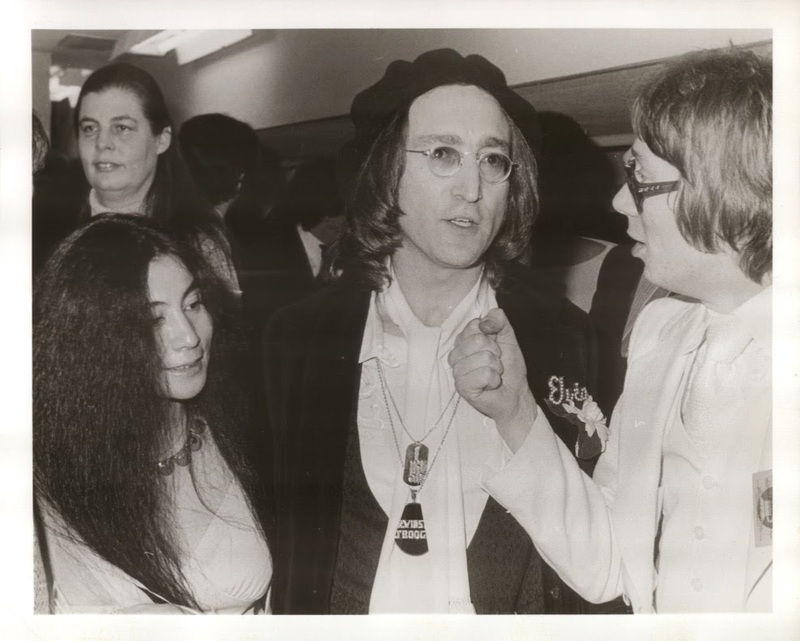 The photo was taken by my friend Bob Gruen on March 1, 1975 at the annual Grammy Awards show, held that year in New York, where John put in a guest appearance as an award presenter. I spotted him in the foyer of the theatre on my way in and went over to have a chat with him and Yoko, pretending to interview him with a microphone in my hand and not, as has been suggested by others who’ve seen this pic, pretending to thump him in the face. I began writing about music in 1968 as a reporter on the Telegraph & Argus, the evening paper published in Bradford in Yorkshire, my home county. The chief sub-editor, Leon Hickman, and I managed to persuade the editor that half a page of pop news once a week might attract younger readers to the T&A, and much to our delight he agreed. Over the next year or so I began to review albums and concerts and did a few interviews by phone, including Jimmy Page talking about his hopes for a new group he’d formed with the unusual name of Led Zeppelin. I also wrote about some local bands and found myself organizing a beat group competition at the local disco, the Penny Farthing. Another judge was Polydor Records’ PR chief Mike Hales who came up from London and thus became the first genuine music industry executive I ever met. I ear-bashed the hell out of him that night. Emboldened by all this, in late 1969 I answered an ad for a job on Melody Maker, went for an interview but didn’t get it. Six months later I got a call from MM’s editor. There was another vacancy. Was I still interested? Was I ever… and from May 1970 to February 1977 had the best job in the world, becoming MM’s News Editor and, in 1973, their US Correspondent based firstly in LA and then, for three years, New York. I cannot remember the names of everyone I interviewed in this time but sufficient to say the list would include just about every major league rock performer of the era from John and Paul Beatle on downwards, though I never snagged Dylan and missed out on seeing Elvis. I became quite close to a few groups, most notably The Who and Slade. I was also in at the beginning of the NY CBGBs scene, befriending Debbie Harry before she and Chris Stein formed Blondie, and staring vacantly at Richard Hell in Television wearing a torn t-shirt, spiky hair and shades. I think Malcolm McLaren might have been stood behind me taking notes. Another highlight was going on the road with Bruce Springsteen 18 months before his Born To Run album and watching his progress from the latest ‘new Dylan’ to slightly reluctant superstar. After MM I hung on in New York, working for Sir Productions, which managed The Who’s US affairs, Rolling Stones tours and also Lynyrd Skynyrd. The Skynyrd plane crash in late 1977 put the kibosh on that so I came back to the UK and got a job at RCA Records in London, doing PR for, among others, David Bowie. I left RCA to become a freelance writer and wrote books, three of which were published by Omnibus Press, one of the few book publishers in the world that specialises exclusively in rock and pop books. Since 1983 I’ve been the editor at Omnibus, responsible for the publication of hundreds of rock and pop books. I retired from working full time for Omnibus in January 2016, and am now a consultant to Omnibus and Music Sales, its parent company. It really all kicked off for me on Saturday, December 21, 1963, when my dad took me to see The Beatles at Bradford Gaumont. Something happened to the wiring in my brain that night and ever since I’ve never stopped thinking about guitars and drums and what a fantastic noise they make. I launched Just Backdated on January 1, 2014, and much of what appears here are reminiscences from my time on MM but there’s some more recent stuff too and when the mood takes me I'll write about a new or newish album or act that I like. I also post extracts from Omnibus books that I think are appropriate to the blog. Although I no longer consider myself a full time music writer I haven’t stopped writing about music and musicians, and I don’t think I ever will. Glad to sse the photo has seen the light of day again. It had a circuitous journey from New York to Gomshall, by way of Amsterdam and the Daily Mirror! Why isn't there much on your blog on Jack Bruce? obvious choice for one of the greatest musicians to shape rock. R.I.P. Hi Chris, I used to read you/MM back in the day so it was a nice surprise to stumble upon your blog. I've been rummaging through your archives and really enjoying your writing, especially the 'unedited' pieces. I'm a big Zep fan but have been on a Who thing recently. Haven't played Quadrophenia in the longest time. What an album! And I still knew all the words. Cheers!